The purpose of the Locust Lane Sidewalk Feasibility Study is to develop conceptual alternatives that would achieve the project goals of improved pedestrian safety and mobility in the Town of Elkton, Maryland. This project is needed to provide safe and accessible pedestrian access to commercial, community, and municipal centers for residents and visitors of the Town. This effort will evaluate the feasibility for future reconstruction to establish a new and improved sidewalk facility for safe pedestrian activity. The study area is located in the northeastern section of Elkton, near the intersection of MD 7/ Main Street and Delaware Avenue. The sidewalk improvement is proposed between Main Street and High Street. 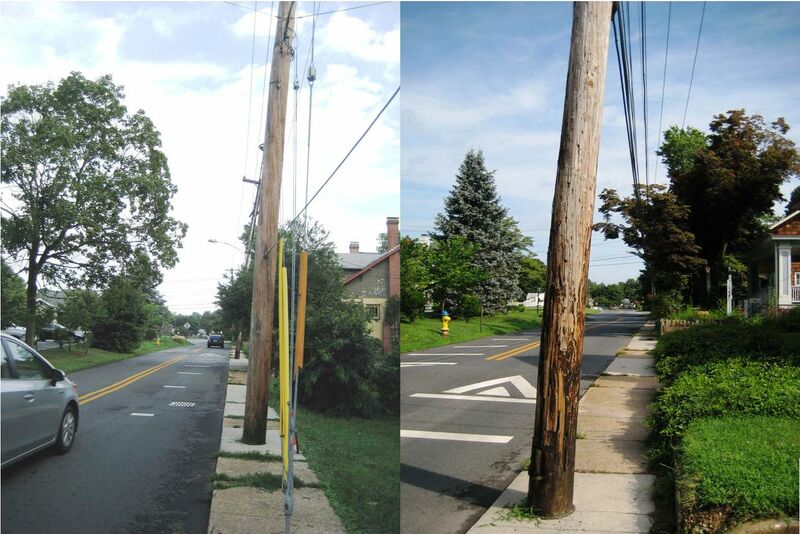 Utility poles and guy wires obstruct pedestrian access along the narrow sidewalk. Address cross-section and consider conflict points and evaluate safety and design issues, including Americans with Disabilities Act (ADA) compliance. Examine relevant site issues which may impact the proposed sidewalk, including adjacent developments. Identify additional amenities to improve user experience such as pedestrian lighting and other enhancements. Input was also be sought from surrounding residents. An Open House Public Workshop was held on Wednesday, May 6, 2015 (flyer; workshop boards). A report was developed to include documentation of existing conditions- including identification of right-of-way issues and utility conflicts- assessment of several conceptual sidewalk alternatives, preliminary cost estimates for planning purposes, and recommendations. This feasibility study identifies four sidewalk upgrade options that meet municipal, MDSHA, and ADA standards. Due to higher costs and traffic disruption to either reconstruct the roadway pavement or relocate utilities, it is recommended to reconstruct the sidewalk to 60” according to Option #2 (Accommodate Utilities) and Option #2A (Sidewalk Extension north of High Street), noted in the table above. Additionally, four improvement measures to address pinch points should be incorporated, along with improved ADA curb ramps. The project should also include pedestrian signage and crosswalks which are currently lacking in the area.